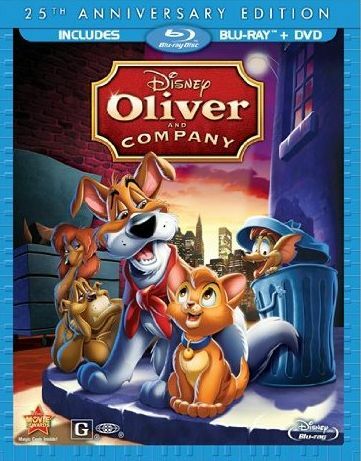 Of the three, Oliver & Company is the one I remembered the least. The other two I had seen on The Disney Chanel a bunch of times when I was a kid, and Sword in the Stone back in 2008 when I reviewed the DVD, but I'm pretty sure I've only seen this film once and it was so long ago that I didn't remember a thing about it. This is another one of Disney's musical movies, though I confess that I didn't enjoy the songs as much as the later Disney films like The Little Mermaid or Beauty in the Beast, or even earlier films like The Jungle Book. It's not that the songs were bad, I just didn't find them catchy or emotional. Like the other blu-ray releases, this one also seems to have been given a restoration, as it looks much more clean than I would have expected. Only the opening credits looked a bit grainy. This Disney film is inspired by Oliver Twist, where the young orphan Oliver is represented by a cute little orange Tabby kitten who doesn't get adopted like all of his siblings and finds himself out in the big bad world of New York City after his box is destroyed by a rain storm. It doesn't take long before he runs into a street-smart dog named Doger uses Oliver as a diversion to steal some sausages. But when Doger refuses to share the haul, Oliver follows Doger back to his gang's hangout and literally falls into the middle of the group, which consists of Tito the Chihuahua, Einstein the Great Dane, Rita the Saluki, and Francis the Bulldog. Each character has their own unique personality, though these personalities don't seem to play a big role in the plot nor is there much witty banter between the characters. The group accepts Oliver as one of the gang and decide to show them the ropes. I think they are supposed to be a pickpocket gang that brings home loot to their lovable criminal owner Fagin, but we never see them pickpocketing anything. Instead it just seems like they find broken crap and bring it home. So during their first time out with Oliver when their showing him the ropes, a con gone wrong winds up with Oliver in lap of a young girl named Jenny Foxworth whose rich parents are out of town, and she adopts him. Doger and the gang set off to rescue Oliver, not knowing that he is enjoying his time with Jenny and has found a new home. Now, Fagin owes a lot of money to an evil loan shark named Sykes, so a whole ransom thing gets going, but I won't get into that. What I will say is that the ending is kinda extreme for a kids' film. I mean, and spoiler alert here, the evil dogs get thrown off a car onto an electrified train track, and Sykes smashes his car head on into a train... so yeah, there's that. Seems a bit extreme for a G rated movie. The animation was nice, and blended nice with the CG animation that was used for several of the vehicles and some other scenes. There were some really nice animated shots using the CG that impressed me. If it wasn't for the camera motion I don't think I would have known what was CG and what wasn't. Unlike the other two blu-ray releases, this one doesn't include a digital copy, but it does have a bunch of onus features. There's two animated shorts, two featurettes, one of which is a making-of, and a sing along mode. The making-of is interesting but short, like 5-6 minutes long, and the Disney's Animated Animals is even shorter, like maybe 90 seconds. The two animated shorts both feature Pluto, who is one of my least favorite Disney characters. Don't ask me why because I really don't know. This is a fine animated feature film which looked nice and skillfully integrated CG elements, but it just failed to strike a cord with me. After the opening sequence with Oliver not getting adopted and being alone in the rain without a home, I didn't feel much emotion from it, and after it was over I didn't have any of the songs stuck in my head. I couldn't even remember what they sounded like. So I'd suggest renting it.